Local Scholarships deadline 3:00 pm Friday, February 8, 2019. Turn your completed packets in to the Mrs. Nunes in the College and Career Center. www.classroom.google.com class 2p6hz click on "Classwork." In order to save the PDF copy of the work that you do in this fillable form, please make sure your Adobe Reader is up to date. Visit https://get.adobe.com/reader/ and download the latest FREE version of Adobe Reader. Download the by clicking on the link below and save it to your computer or to a cloud account before beginning to work on the application. Close the application and open it again using Adobe Reader (if it opens in a tab in your web browser, your work will NOT be saved)! * All fields that are in red are required and must have a value to submit the form. * Make sure that you save your work! ** See below for instructions on how to submit your application. If you need help visit the College & Career Center located in the Library for help, and/or attend Counseling's Office Hours on Thursdays & Fridays for help. Some scholarships require a supplemental application and/or essay. Please review the Local Scholarships List carefully and visit the Supplemental Applications webpage for additional information regarding scholarships that require a supplemental or separate application. Autobiographical essay is required; one page, will be strictly enforced. Formatting your essay is important! Second Paragraph:Mention your current situation, academic accomplishments, extra-curricular activities, job or volunteer experiences; interesting things about yourself (interests, travel experiences, etc.) as it relates to the scholarship you are applying for and/or your future plans. Third Paragraph:Mention your career/college plans, areas of study in which you are interested, and why you need the money to achieve your goals and how you will use the money. Include what you would like to be doing in five to ten years that might be relevant to your scholarship award sponsor. In your application packet you will need to provide two letters of recommendation. You can ask a teacher, a community member, your employer… It should be someone who knows you well. Your recommender should be someone with whom you have a good relationships. If you plan to ask your counselor for a letter of recommendation, please download a Letter of Recommendation Request Form. 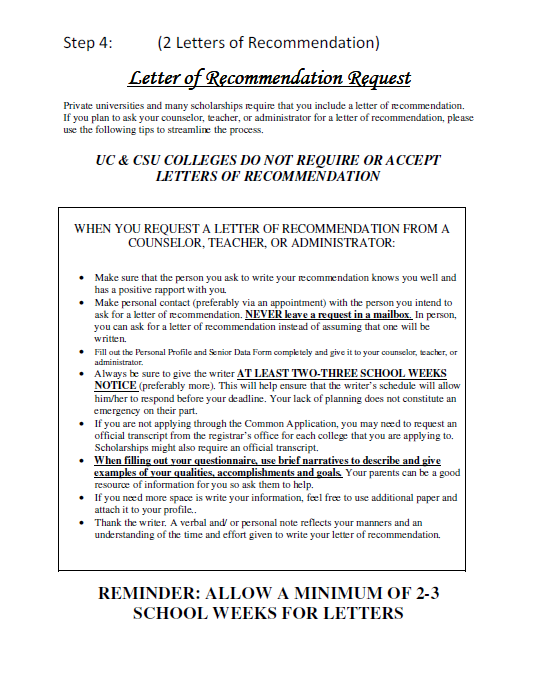 Allow your counselor 2-3 weeks to complete letter of recommendation. You can make copies to give to the other people you will be asking for a letter from. Fill the form out COMPLETELY. Narratives always help, and be as detailed as possible. * If you are struggling for material ask your parents for help, we love to brag about our children’s accomplishments. You will need to request an unofficial transcript from the registrar's office. Please review the scholarship descriptions to determine if you need an official transcript. Put your packet in order listed in on the At-a-Glance photo and make as many copies as you need; you should make a copy for each scholarship for which you are applying. scholarships you are applying for. 1. Print out a copy of the application for EACH scholarship for which you intend to apply. 2. Go to www.classroom.google.com, class 2p6hz (SHS Local Scholarships) click on "Classwork" and go to"**Local Scholarship Submission" and follow the instructions for submitting your application digitally, in addition to your paper copies from Step #3. Submit your completed Local Scholarships Application to the College & Career Center by 3:00 pm Friday, February 8, 2019.